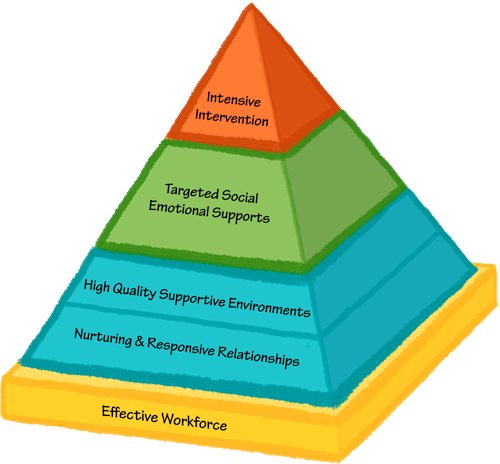 The National Training Institute on Effective Practices aims to provide professionals with an in-depth, intensive learning experience around the Pyramid Model framework for addressing the social and emotional development and challenging behavior of young children. We encourage anyone interested in learning more about the Pyramid Model framework, learning new strategies and hearing about new research to attend. Individuals who may benefit from the Institute include administrators, coaches, behavior specialists, higher education faculty, teachers and child care staff to name a few. Topics and speakers have been chosen carefully to provide NTI participants with a high-quality learning experience related to promoting the social and emotional competence of young children, addressing challenging behavior, improving systems and practices and building systems of care. The conference offers both in-depth training workshops and shorter tool-kit sessions. Seven three-hour sessions are offered Wednesday and Thursday morning and afternoon. Participants do not need to sign up in advance and will be free to choose which sessions to attend. These are brief sessions (60 minutes) that are focused on one practice, strategy or element of implementation. We will offer three rounds of our toolkit sessions on Friday morning. These sessions will offer NTI participants a variety of choices for learning very focused content. They will be designed to offer information relevant for coaches, administrators, practitioners and leadership teams. Pre-conference workshops are offered at an additional cost. Pre-conference workshops are one or two days in duration and offered before the conference begins. Want to know what kinds of session topics to expect? Check out last year's program. Not familiar with the Pyramid Model? View an introductory presentation.